Kolmanskop is a famous ghost town in the Namib desert in southern Namibia, a few kilometres inland from the port town of Lüderitz. Once a small but thriving diamond-mining town, Kolmanskop is now abandoned, fighting a constant battle against the devouring sands of the desert that is poised to reclaim the town back to where it belongs. Founded in 1908 when a rail worker named Zacharias Lewala in the area discovered a diamond, the town enjoyed nearly fifty years of history until it was abandoned in 1954 when the diamond mines finally dried up. Prior to the diamond fever, Kolmanskop was a small, insignificant town – so insignificant that it was named after a simple transport driver named Johnny Coleman who, during a sand storm, abandoned his ox wagon on a small incline opposite the settlement. When Zacharias Lewala discovered shiny rocks in the area, he showed it to his supervisor, the German railroad inspector August Stauch. Mr Stauch, was convinced it was a diamond and when this was confirmed, the news spread like wildfire, sparking a huge, frantic diamond rush and causing fortune hunters to converge in droves on Kolmanskop. The town soon developed, becoming a bustling little center with large, elegant houses in German architectural style complete with an impressive array of amenities including; a hospital, ballroom, power station, school, 4-lane skittle alley, theatre and sports hall, casino, ice factory and the first x-ray station in the southern hemisphere. Fresh meat could be purchased at the butcher's, there was a bakery, furniture factory, a public playground and even a swimming pool. 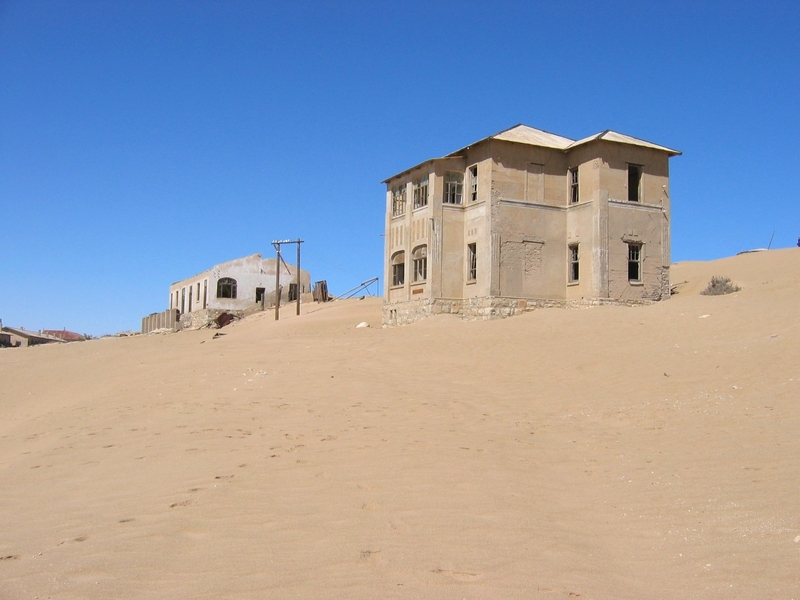 Kolmanskop also had the first tram in Africa, and a small railway linked it to the neighboring coastal town of Lüderitz. The development of Kolmanskop reached its pinnacle in the 1920's with nearly 1,200 residents from some 700 families. Unfortunately for Kolmanskop, after World War I the diamond-field slowly exhausted and it's inhabitants moved south where new and richer diamond deposits were discovered. Today the ghost town's crumbling ruins bear little resemblance to its former glory. The magnificent houses have been nearly demolished by the wind and knee-deep sand. In 1980, the mining company De Beers, restored a number of buildings, and established and interesting museum, which has now become a tourist attraction. Kolmanskop’s picturesque setting provide thousands of opportunities for photographers. The town was used a number of times for filming – in the 1993 film Dust Devil and in the 2000 film The King Is Alive, and again in a 2010 episode of Life After People: The Series. Numerous TV series where shot in this location including one episode of the BBC series Wonders of the Universe.